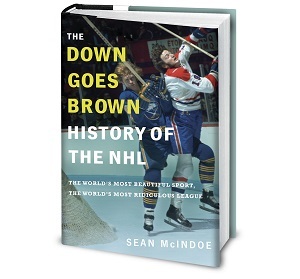 Down Goes Brown: What if the NHL gave out two of every award like MLB? What if the NHL gave out two of every award like MLB? It’s awards week in Major League Baseball. The sport doesn’t handle their honours the way hockey does; there’s no cheesy Vegas ceremony, with B-list celebrities and awkward acceptance speeches. Instead, we just get a series of announcements throughout the week, with each day bringing new winners. That’s winners, plural, which is the other key difference from the NHL. Baseball gives out separate awards to both the American and National Leagues, meaning that twice as many players get to win an MVP, Cy Young, or Rookie of the Year every season. That seems like a small difference, but it’s really not. Post-season awards (or a lack thereof) can change our entire perception of a player’s legacy, so baseball having twice as many as other sports is a big deal. It’s why Alex Rodriquez and Albert Pujols can both claim to be three-time MVPs – voters didn’t have to choose between them in 2005, when they both won. Instead of voters having to choose between Pedro Martinez and Randy Johnson at their peak, they could just both win the Cy Young. Same with Bryce Harper and Mike Trout for the Rookie of the Year in 2012. Baseball has its reasons for handling awards that way. But what if the NHL did the same? How would hockey history look different if the sport gave out awards to the top vote-getter in each conference? We'll never know for sure, but we can dig into the voting history (via hockey-reference.com) to figure out which players might have more hardware on their shelves in an alternate universe where hockey had decided to follow baseball's lead. For sake of argument, we'll assume that the leading vote-getter from each conference would have won. That's probably not entirely true, since voters would have been looking at their ballots differently, but it gives us a guide. So how does hockey history look different if we split the awards based on conference? Nothing changes until the Original Six era ends in 1967, of course, but then things start to get weird. For obvious reasons, this is the one award that doesn't produce any multiple-time winners. But we do get to add "Rookie of the Year" to the resumes of a long list of players, including current names like Shayne Gostisbehere, Johnny Gaudreau, Logan Couture and Dion Phaneuf. A few of today's most-respected veterans pick up some extra hardware as well, including Marian Hossa (1999), Jarome Iginla (1997), and the technically still-active Pavel Datsyuk (2002). Digging a little deeper, a few of today's borderline Hall of Fame cases would get some help, as Mark Recchi (1990) and Paul Kariya (1995) both earn Calders. So do a few players who are already enshrined at the Hall, like Phil Housley (1983) and Steve Yzerman (1984). Some team histories start to look different, too. In the real world, Auston Matthews, Mitch Marner and William Nylander are all trying to become the first Maple Leaf to win a Calder Trophy since Brit Selby in 1966. But split the award by conference and the Leafs add two more wins – Wendel Clark in 1985 and Mike Palmateer in 1977. And we even get to honour a current coach and GM, as Darryl Sutter (1981) and Ron Hextall (1987) earn trophies. That news would surely put a smile on their faces, if either of them were capable of that. But with all due respect to our various new Calder winners, things don't start to get truly strange until we move on to some of the other awards.